This Phillip Lim sweater is a treat. 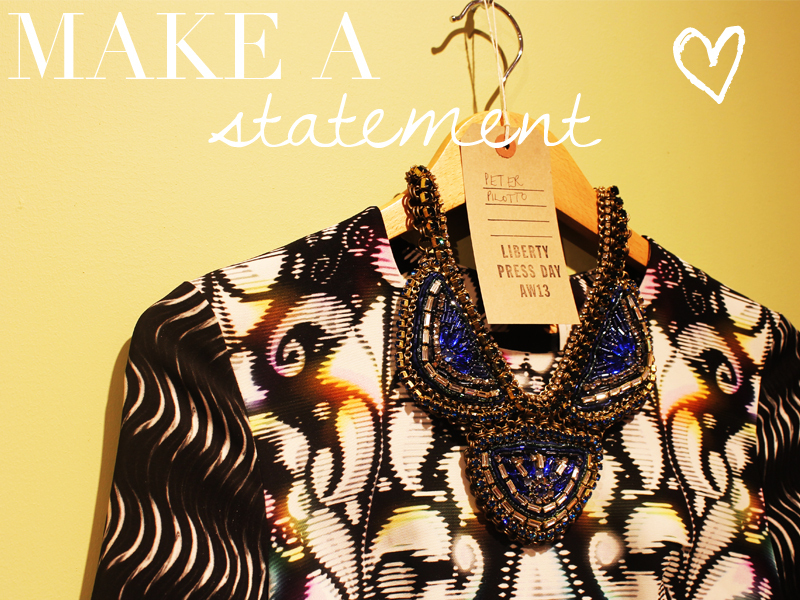 This week I popped along to the Liberty London press day and must say I was very impressed with the collections for A/W13. 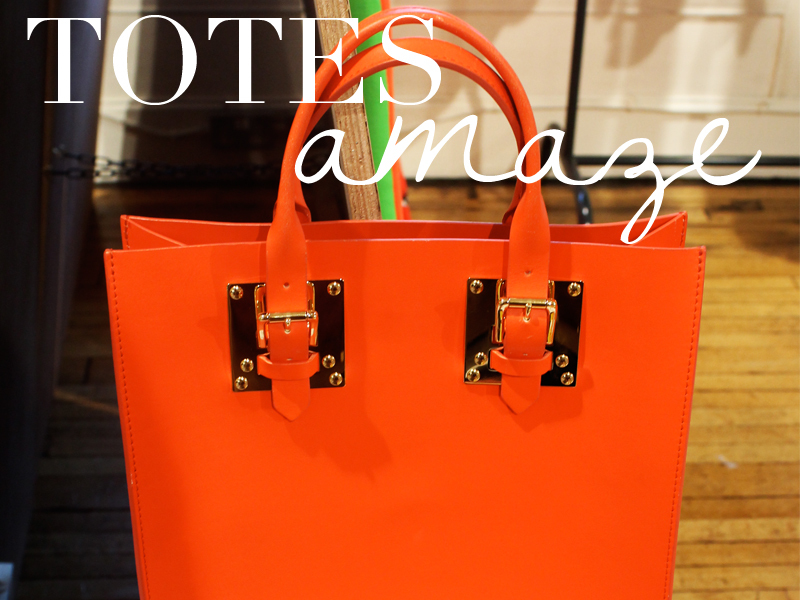 This Sophie Hulme tote is a beauty. 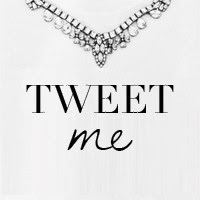 As far as accessories go, I was particularly drawn to the handbags by Sophie Hulme (as you probably know by now...) and the incredibly beautiful statement necklaces by brands including Svevo, which were added to everything from printed separates through to fluffy sweaters. This orange handbag by Sophie Hulme (pictured above) is a stunning piece for Winter- perfect for brightening up dull Autumnal neutrals such as khaki green and dusty navy. These Sophie Hulme charms are a perfect gift- love the tropical pineapple! This Etoile Isabel Marant shearling jacket was a huge favourite of mine at the press day. The minute I laid eyes on this short shearling jacket from Etoile by Isabel Marant, I was a little bit of a smitten kitten. It is super soft and cosy and looks so incredibly stylish! With zip fastening up the front, this jacket is bang on for the new season. I'd wear with simple leather pants and some beautiful booties. It's almost worth wishing away this unexpected London sunshine! These kooky glasses aren't quite to my taste, but I can imagine a plethora of bloggers adopting these come fashion week! 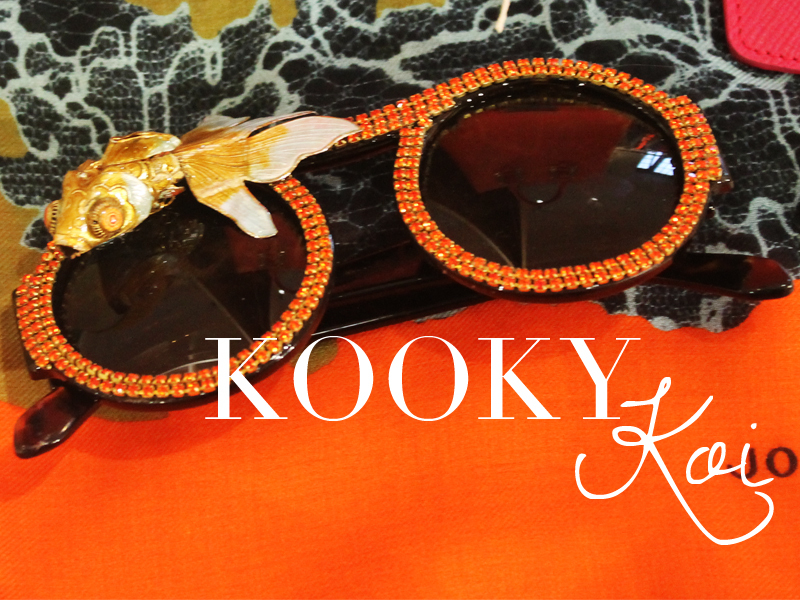 With kooky Koi and goldfish embellished sunglasses on offer, Liberty's accessories department remains a bit of an Aladdin's cave for eccentric sorts. These specs are quite something! 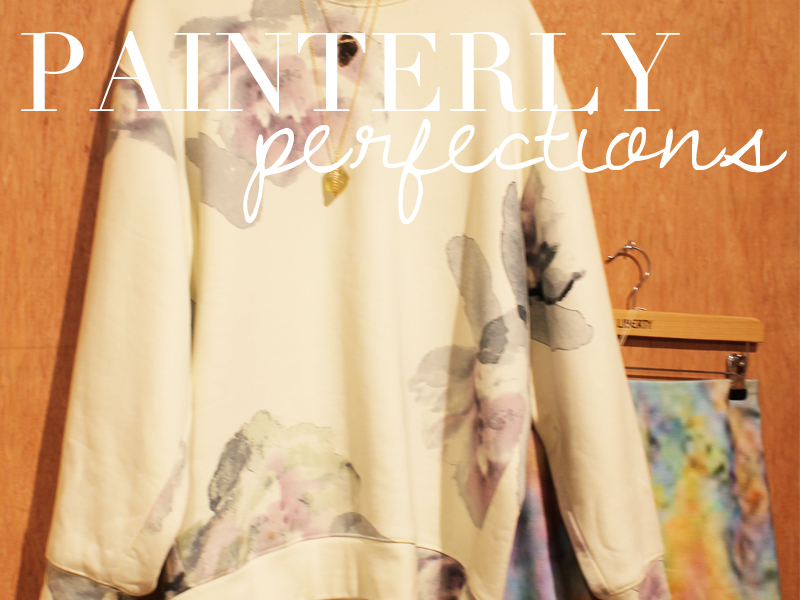 Watercolour florals from ACNE in unexpected shapes and styles were another hit- I adore this painterly sweater. I'm so typically girly, aren't I ? I absolutely adored these beautiful watercolour styles from ACNE, perfect for prettying up a Winter wardrobe. The sweet A-line skirt would be just divine with a simple grey sweater, while the floral sweater is the perfect investment piece that would work for any weather. 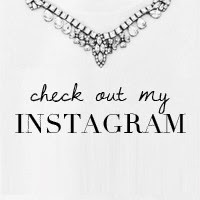 There were some insanely covetable accessories on show. 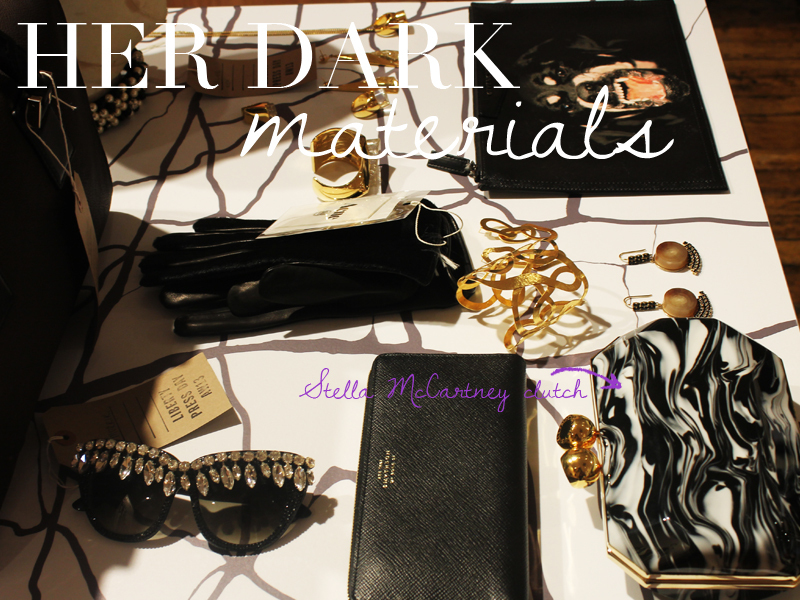 In stark contrast, all this luxe black jewellery and accessories is perfect for going all dark and dangerous next season. 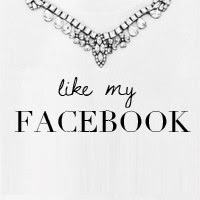 How much better would that Stella clutch make your LBD, huh? With her debut collection at Liberty, Victoria by Victoria Beckham's maroon wool shift is a key piece for Winter. Rather excitingly, Victoria by Victoria Beckham is now stocked at Liberty, and I really did fall head over heels for this vibrant maroon wool shift which is sure to be incredibly flattering on. I'd wear with camel for a really slick look that feels very on trend for A/W 2013. 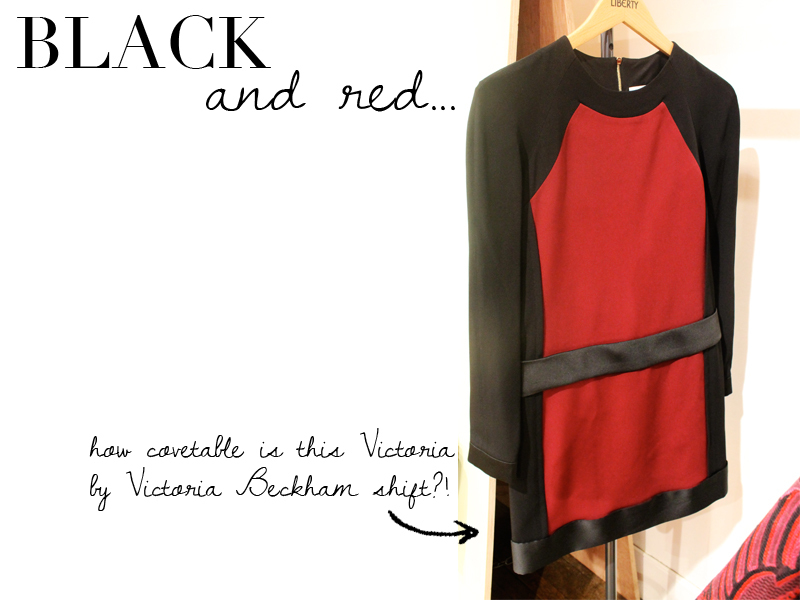 Another key piece from Victoria by Victoria Beckham, this rich red and black dress with satin detailing is a wonderful day-to-night style which would look incredible dressed up with lots of gold jewellery and killer heels. Red soles and lipstick = essential. I adore everything by Givenchy, and really surprised myself for adoring this leather zip pouch/clutch. 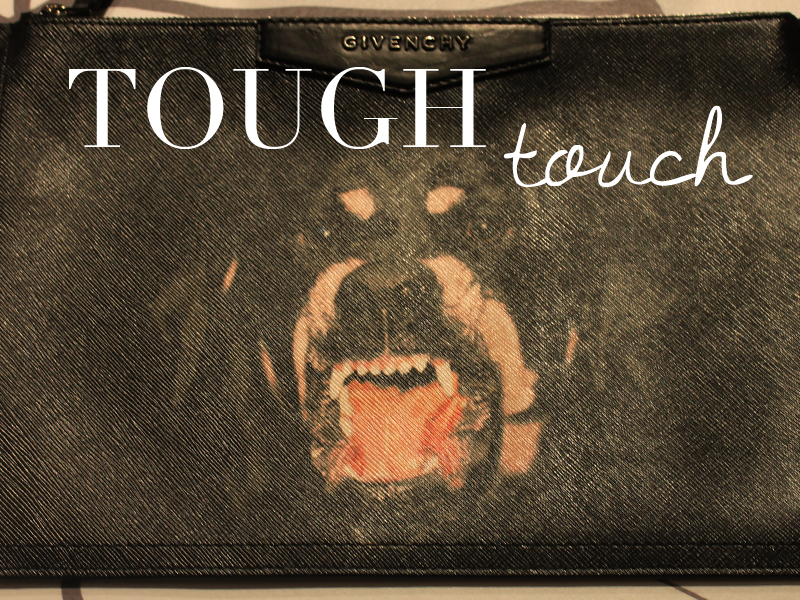 With a vicious dog on the front, this one shows you mean business, missy. 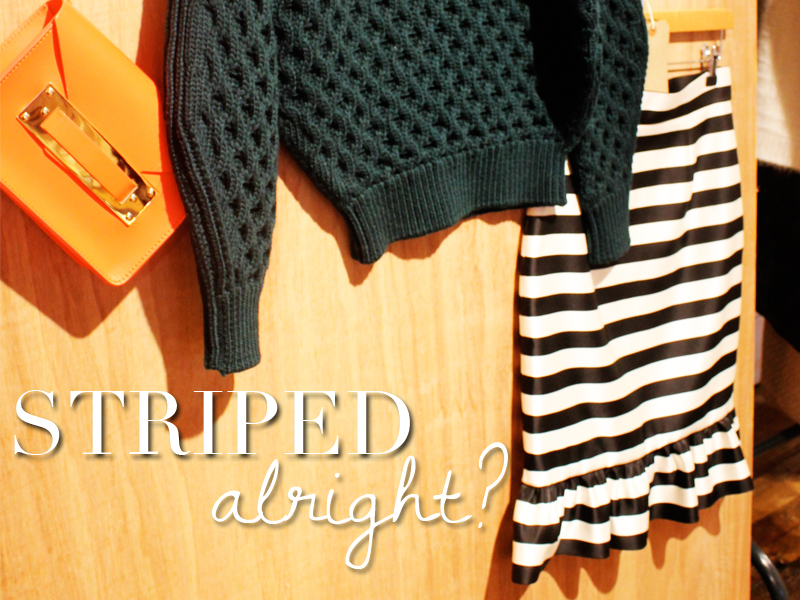 This black and white striped skirt with frill detail looks amazing with a chunky green Etoile Isabel Marant sweater. A big trend at the press day was the fitted, sculpting skirt style accented with subtly frilled/flared hems. This is great for workwear I find, particularly in bold prints such as these stripes and Wintry florals. 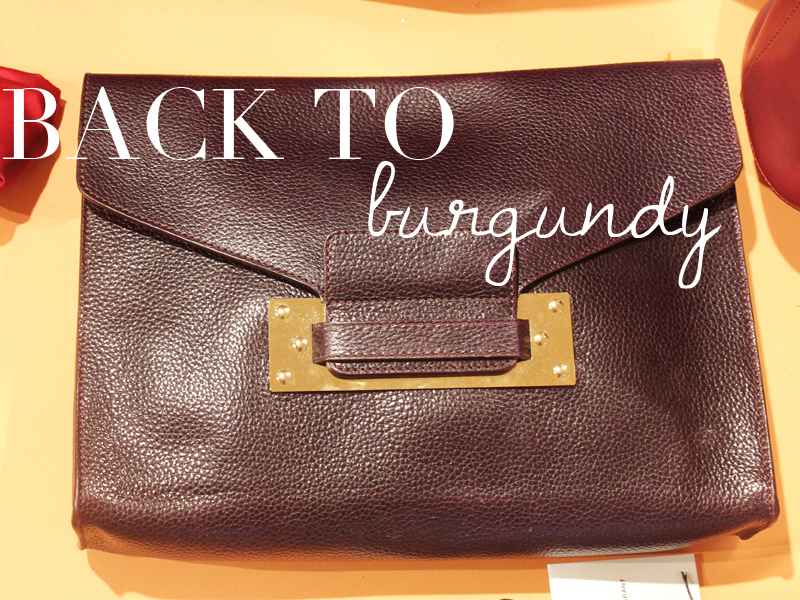 This burgundy leather Sophie Hulme clutch is a perfect new season staple. Another Sophie Hulme piece, this oversized clutch is practical, not to mention wonderfully rich and beautifully crafted. 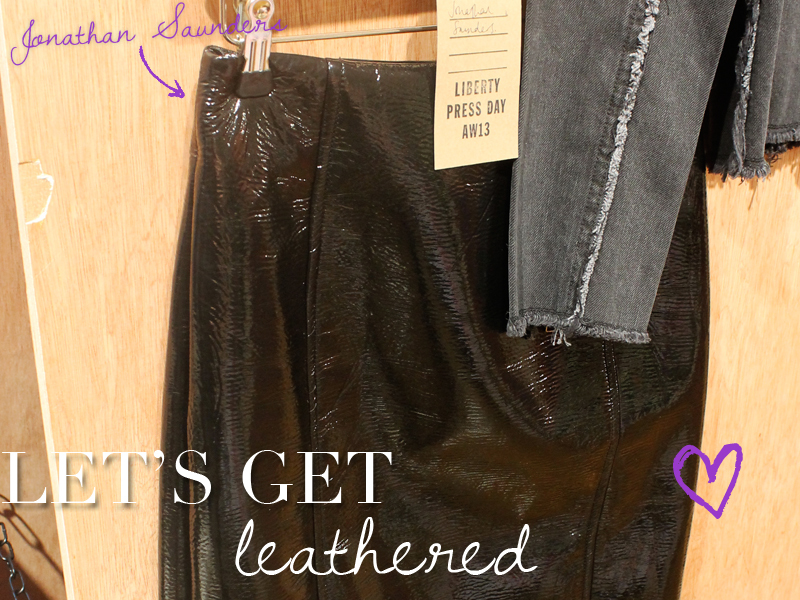 Get glossy with this killer Jonathan Saunders skirt. Wet look leather is another huge trend for the new season, and this tight Jonathan Saunders skirt is a real favourite of mine. Also available in a slightly more forgiving flared style, this fitted one is seriously hot. I'd wear with a chunky mohair sweater untucked and my favourite Rockstud-inspired Zara kitten heels to stop it looking too much. Contrast a fluffy mohair sweater with chunky jewellery for a striking look. 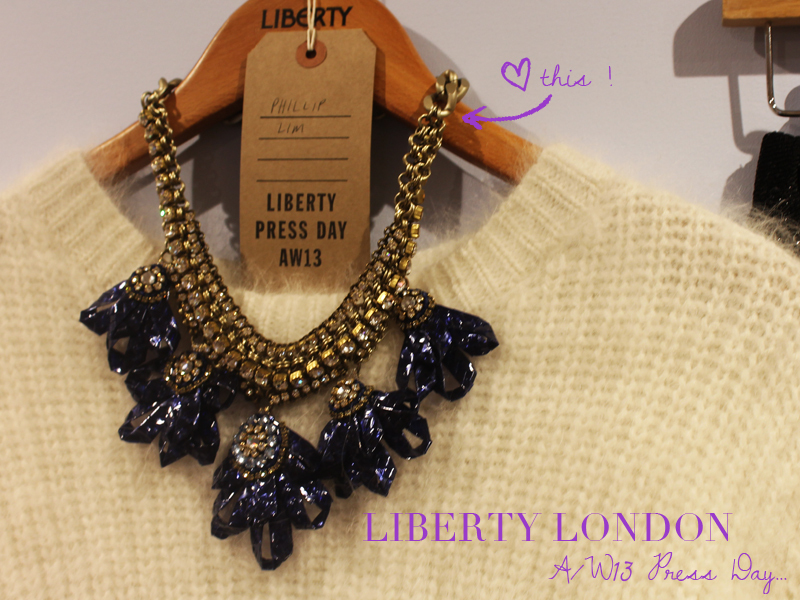 This collar necklace looked particularly strong when styled with a delightfully cosy cream sweater. This is a great way to modernise your look for the season ahead, it's all about playing around with textures and contrasts. Peter Pilotto is one of the more established brands stocked at Liberty, but his pieces still pack such a powerful punch in the industry. 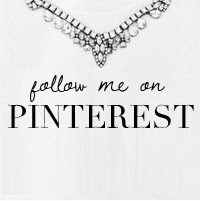 I love this swirling monochromatic printed piece. This Dries Van Noten shift is a killer party season piece- made for dancing. 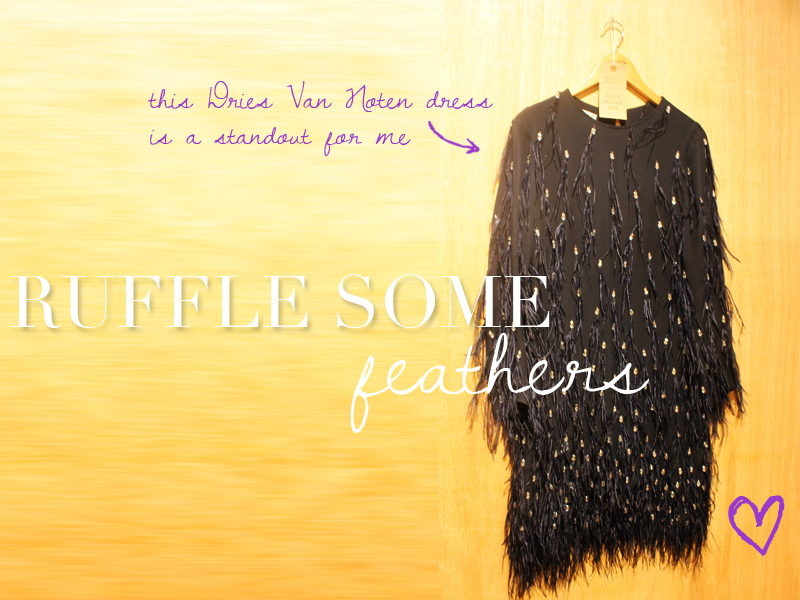 The standout piece for the party season has to be this Dries Van Noten feathered dress with sequin detailing. It is so light and elegant, yet has such seductive movement and the most alluring little twinkle. With clear inspiration from the 1920s, this style feels all the more apt with the upcoming release of The Great Gatsby. Also note the choice of ink over black- that will make all the difference come party season. This two piece would look incredible on. 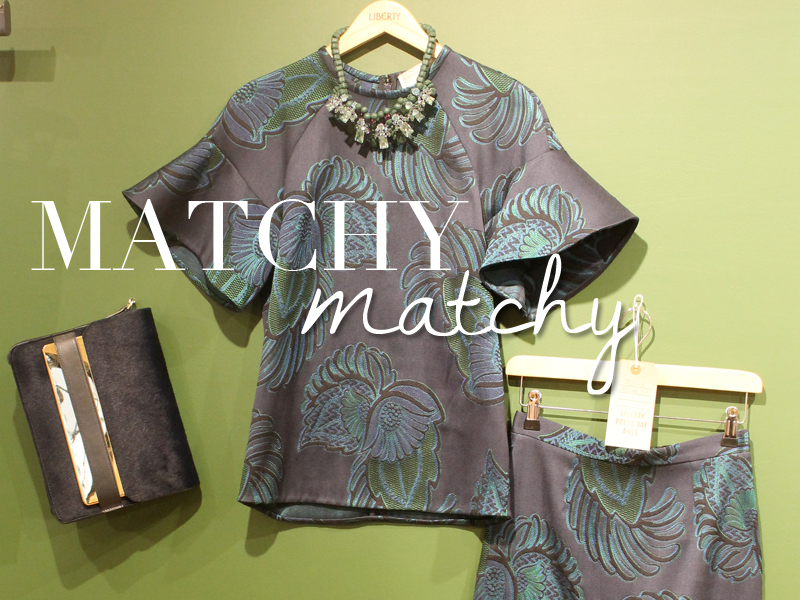 I mentioned printed separates earlier on, and these cool tonal pieces are just divine. Marrying muted shades of ink, emerald and black, these structured staples are ideal for work, and sure to be a fashion week hit. 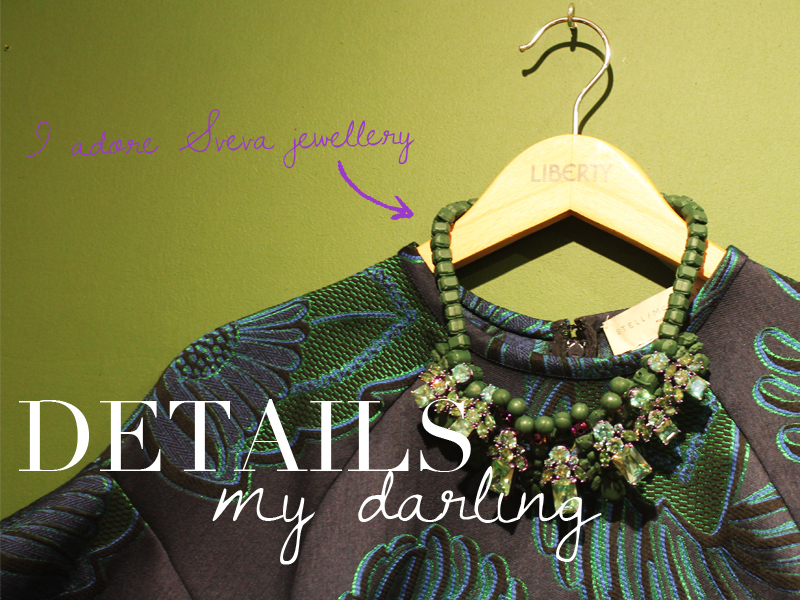 The jewellery on offer from Liberty for Autumn is truly marvellous and perfectly compliments the womenswear collections, as demonstrated by this khaki green collar, which looks luscious but still very fresh with this printed ensemble. A hit for both men and women, the luxe varsity jacket is going to be huge next season and I adore this one. Worn with simple black skinnies and a Zoe Karssen tee this would just be a dream. I've never really been a big one for baseball jackets, but this luxed up version is so stylish. In chunky wool it's also (reasonably) practical. 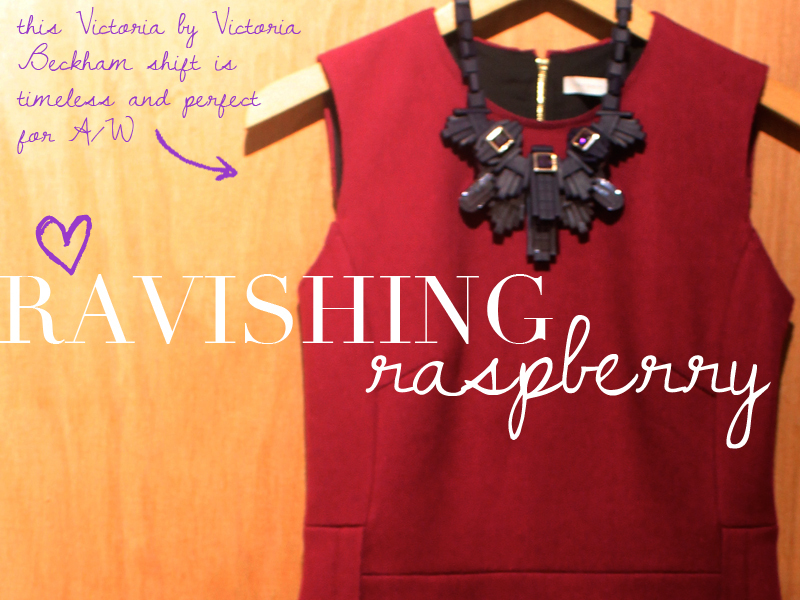 Adorned with lightly twinkling embellishment, this will instantly update your look. Last but not least is this incredible navy and black jacket from label du jour Sophie Hulme. 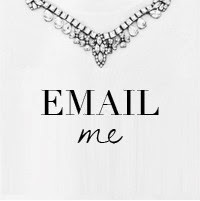 I neeeed it! Rather more to my taste, this navy and black biker from Sophie Hulme is just so cool. I love black and navy together (it is not a faux pas, I promise) and this staple jacket will marry any outfit together perfectly. 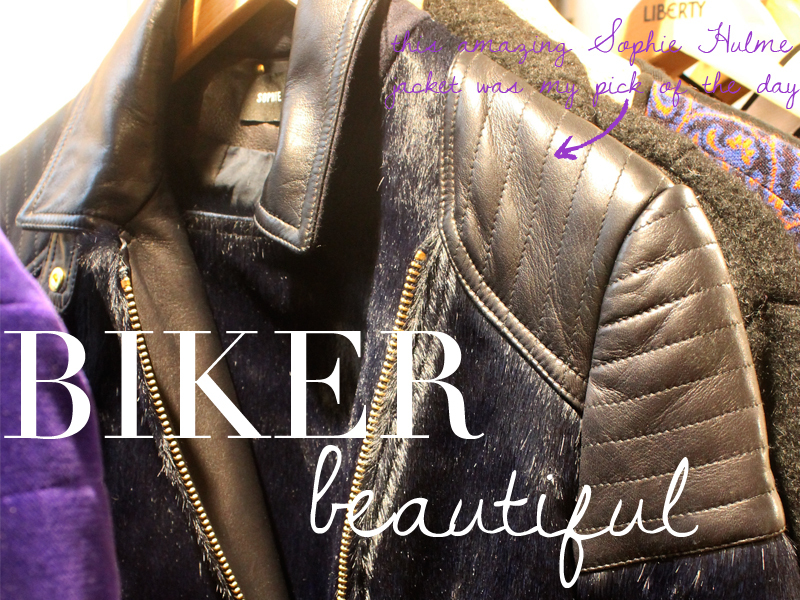 With soft navy horsehair meeting black leather biker detail with glamourous gold hardware, this is my new must have. 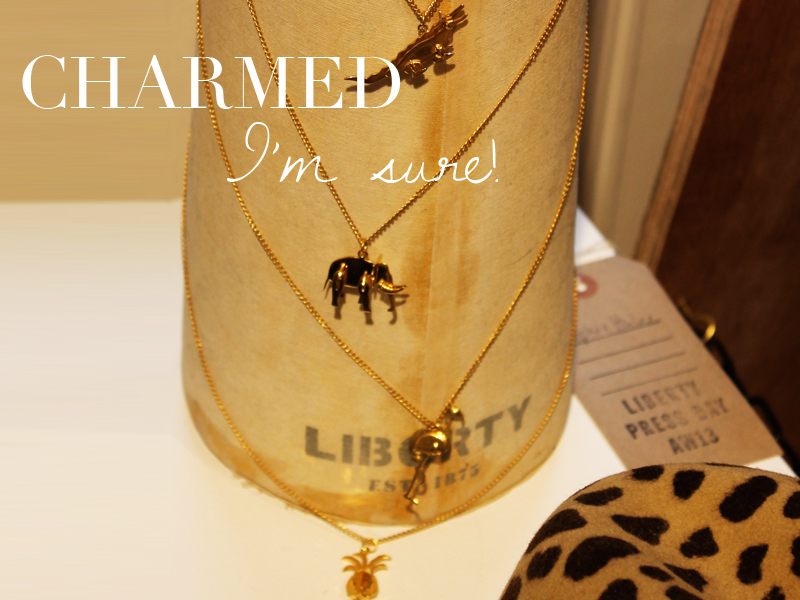 Shop the current collection from Liberty here.